The story of Hayes Valley is one of revitalization. In just 20 years, it’s transformed from a neighborhood on the down and out into a “haven for haute couture.” Part of the Western Addition district of San Francisco, SF Gate attributes the transformation in part to the destruction of the Central Freeway by the 1989 earthquake. Now, it’s home to fashion and home-decor boutiques, dessert shops, unforgettable watering holes, and trendy restaurants—all while retaining a close-knit neighborhood feel. Karen headed to Hayes Valley to meet up with distributors who help share Montanya rums with the region. A great excuse to share a drink with fellow rum lovers! Right in the center of Hayes valley, the rooms at Hayes Valley Inn are small and European Style, some with shared bathrooms. There’s a bright and sunny corner room to sit in for breakfast as well afternoon tea and cookies (which are provided). It was the perfect place to stay while Karen was on the go, coming “home” only to dress, get organized and sleep. Karen played host to Montanya rum fans, regional sales reps and the “rum curious” at a tiki bar unlike any other: Smuggler's Cove. Featuring the largest rum selection in the United States, Smuggler’s Cove makes exceptional rum cocktails that break all the stereotypes. The incredible interior features vintage tiki artifacts, and of course, Montanya rums are among the many offerings, specifically on the America Rum Flight. Karen loves The Rum Flip made with Montanya Oro. Karen’s next stop, accompanied by the Global Beverage Director of Trader Vics who is an absolute rum aficionado, was the Linden Room for a great pre-dinner stop. The bartender made Karen his own concoction—a straight-up, rum forward cocktail with local liqueur. Of course, there’s more to do in Hayes Valley than drink, and Karen always has an eye out for delicious food that also packs a healthful punch. Take A Mano, an authentic and bustling Italian Bistro. Everything is fresh and beautiful, from the food to the cocktails to the environment. 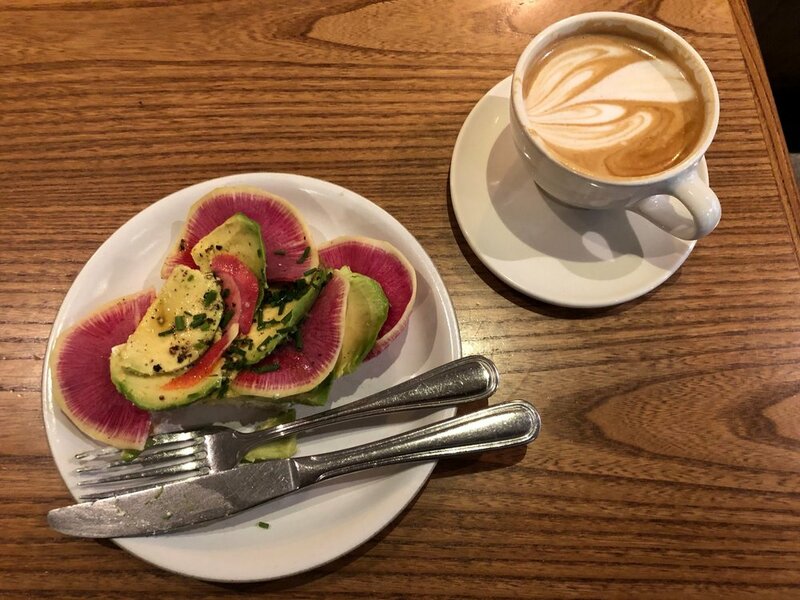 Mazarine Coffee (a bit out of Hayes Valley on Market Street) offers great coffee and delish gluten-free avocado toast. Karen likes to choose her own espresso varietal (almost always east African to her taste) from beans that have the coffee experts raving—and the pour-overs are great, too. The shop can be busy and the lines long, but the staff is fast and efficient and the shop convenient to public transit. For breakfast, La Boulangerie de San Francisco in Hayes Valley has great eggs and veggies, and beautiful sourdough for those who can partake in gluten. Like a little slice of France! And for your daily juice, consider Project Juice. Karen went in for the ginger and turmeric immune system booster because her co-worker was down with the flu in their shared hotel room. Fingers crossed—still healthy so far! The unique circumstances of San Francisco—a.k.a hills and earthquakes—make for fascinating architecture. On this trip, Karen fell in love with a container building, made out of retrofitted shipping containers. What’s your favorite San Francisco or Hayes Valley gem? Let us know in the comments below.